If you need to publish a series of documents on the web and want to avoid unauthorized use of your materials you can protect your copyright by adding a visible text watermark to your files. 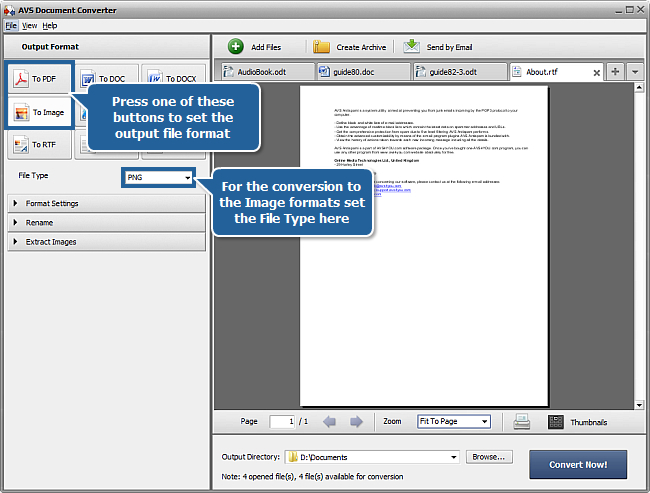 AVS Document Converter allows you to do that without any difficulties. 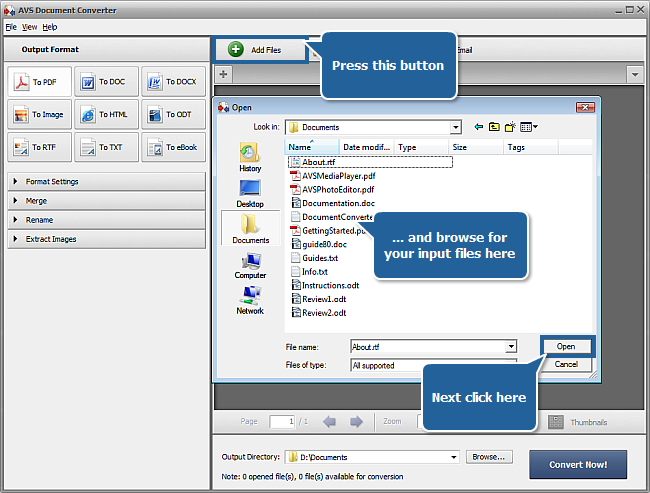 You can perform batch processing of your multiple text files within minimal time. 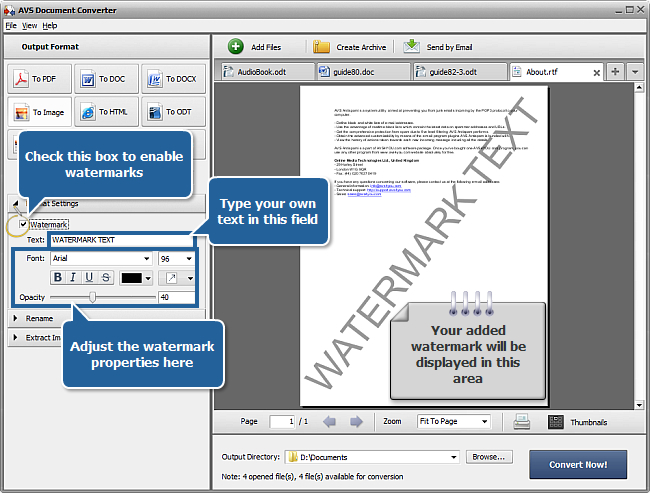 To be able to add a watermark to your documents you must select the PDF or one of the Image output formats. Press the appropriate format button at the Output Format section of the Working Area. If you select the To Image option you will need to set the file type in the File Type drop-down list below the format buttons. The available file types are JPEG, TIFF, GIF, PNG. Note: it is also possible to adjust some format settings. Please refer to our online help for additional information. Open the Format Settings section in the Working Area by clicking the black arrow near it. Check the Watermark check-box. 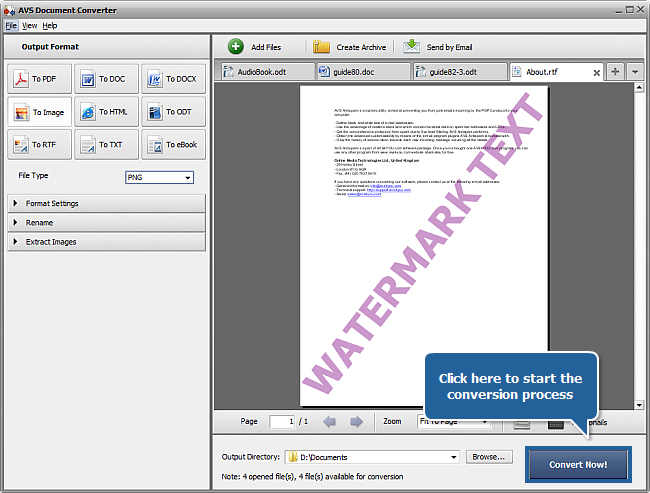 The text watermark will be applied to all the documents loaded into the program. You will be able to preview them in the Preview Area. Type your own text in the Text field and change its properties if needed. Select the font-face from the Font drop-down list. To adjust the font size select the needed value from the drop-down list or use the keyboard. You can select between the Bold (B), Italic (I), Underline (U) or Strikeout (S) font styles using the appropriate buttons. Specify the font color by selecting it from the drop-down list. To change the text opacity use the Opacity slider or enter the needed value in the field near it using the keyboard. The more this value is the less is the watermark transparency. 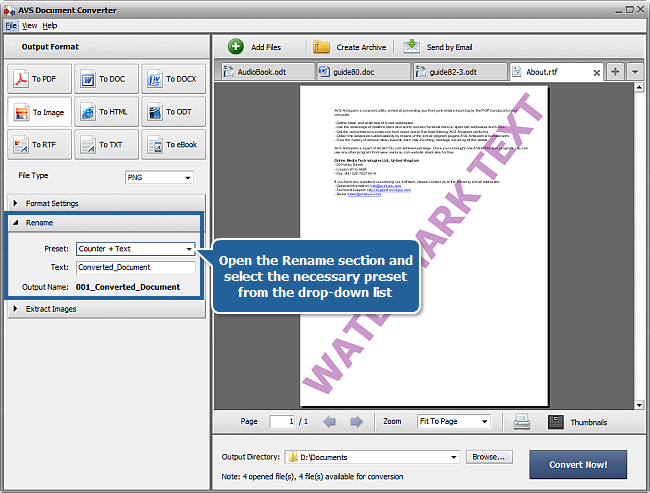 If you want to delete the added watermark before converting documents uncheck the Watermark check-box. 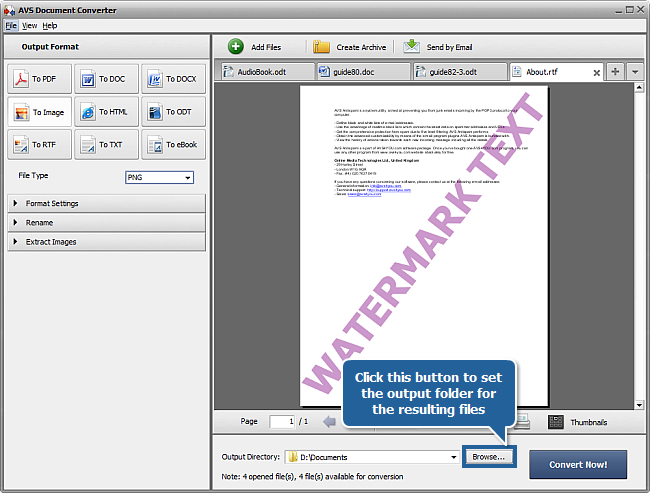 Now you can press the Open folder button and post your watermarked documents on the website.